Learning how to dehydrate meat, vegetables, and other food can save you money and space. It can also keep you stocked for an emergency. Want to survive the apocalypse? Then learn methods to dehydrate food so that you’ll be prepared. Don’t believe the world is coming to an end? Way to stay positive! Seriously, though, even without end times approaching, learning how to dehydrate food is like beaming to another planet and discovering new culinary treats. Indeed, dehydrating food yourself will open you up to a whole new world of gustatory delight. What’s the benefit of learning how to dehydrate food? If you dehydrate food, you can take it anywhere. You don’t need to eat chalkboard-tasting ready-to-eat meals if you’re doing an overnight backpacking trip. Gone are the days when power bars and trail mix are the only sustenance for hikes. Take dehydrated food to work with you. If you need snacks to keep your energy up during the day, dehydrated food is perfect. You don’t have to worry about dehydrated food spoiling like fresh fruit. In fact, dehydrated food lasts not years, but decades. Think about all the food you might throw away because of spoilage. If you learn how to dehydrate food, you’ll save money. You won’t have to consume refrigerated food within mere days. Another benefit of dehydrating food is that you don’t lose any nutritional value. The only thing that goes bye-bye is water. However, one best practice with food dehydration is adding a little pure water before you eat it. Many nutrients are water-soluble. The B vitamin complex are water-soluble. Without water, you’re not going to absorb the B vitamins. In ancient times, people preserved their food by salting and dehydration. Thus, learning how to dehydrate food is not a recent hipster trend. It’s a tens-of-thousands of years-old preservative technique. Another benefit of food dehydration is the taste. Many people who have “gone dry” swear that dehydrated food tastes better. One example is tomatoes. Unless you’re in Israel, Italy, Greece or elsewhere in the Mediterranean, tomatoes from the supermarket often taste bland. But magically, out of a food dehydrator, they come back to life. When you remove the excess moisture, food suddenly tastes alive. What foods can you learn how to dehydrate? These days, you can dehydrate virtually any food. You can even learn how to dehydrate meat. What else can you dehydrate? Pasta, milk, chocolate, crackers … basically, anything. The most common way to dehydrate food is by using a food dehydrator. This is arguably the easiest method. As with any other product, prices range from low to high. You don’t need a top-of-the-line machine. But if you do have the budget and plan on dehydrating lots of food, it’s best to go for a high-quality dehydrator. Want the best-tasting dehydrated snacks? Then dehydrate only one type of food at a time. And make sure to cut all the slices to the same size and thickness. Not sure what to start with? Most people start by learning how to dehydrate vegetables, nuts and fruit. Another marker of a good dehydrator is a unit that has a dual heating element and fan. Temperature and airflow are the two most important aspects of a food dehydrator. You also want a dehydrator with several trays. There should also be an adjustable thermostat. If you want to learn how to dehydrate meat to make your own jerky, the temperature will be different than dehydrating apples. 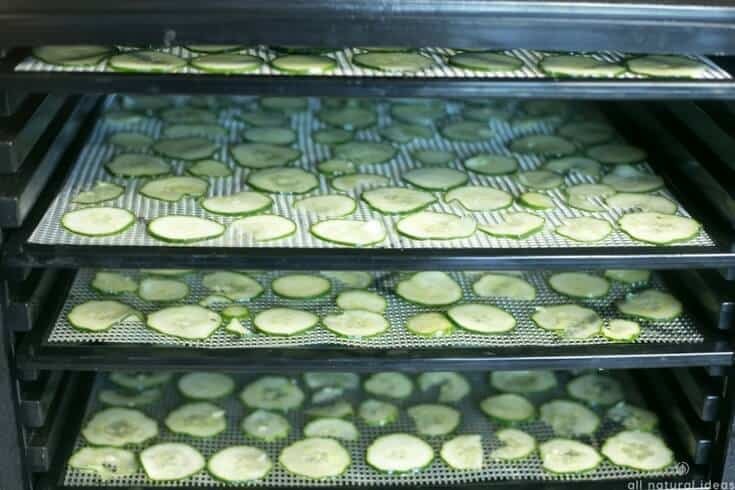 In addition, the trays in the dehydrator should be easy to clean. Moreover, good food dehydrating units distribute heat evenly. And a high-quality unit like this one, the temperature fluctuates up and down to prevent mold and bacteria growth. You can use your oven to dehydrate food. When you preheat your oven, the thermostat usually is set to the lowest setting (150 degrees). Leave the temperature at that setting. Once your oven beeps, you can place a baking sheet with your small-piece cuts of fruits and vegetables. It will usually require up to 8 hours for the dehydration process. This website even suggests using your toaster oven. But be sure to leave the toaster oven slightly ajar. This prevents condensation build-up. Only use your toaster oven if you don’t have any other option, though. It’s better to use a conventional oven. The oldest and most traditional way of dehydrating food: drying in the sun. You might not necessarily want to leave fresh ground beef out in the sun to make jerky. However, tomatoes, peppers and herbs are particularly easy things to dehydrate in the sun. But with herbs, make sure you don’t let them hang dry in direct sunlight. You can use a herb sunscreen of sorts. Paper towels or a cheese cloth will prevent sunburn. Some people even use a microwave oven to dehydrate food! Want to learn how to dehydrate meat? Want to make a delicious jerky? It’s easy. Simply marinate your meat (preferably grass-fed, organic) for 12-24 hours. Then, put it in the food dehydrator. Bam, it’s as easy as that. There are dozens of specific food recipes online. If you want the definitive guide for dehydrating food, there’s no better tome than Jennifer MacKenzie’s The Dehydrator Bible. Just remember to not dehydrate different types of food at the same time. And don’t stack slices of food on top of each other. The exception to the rule is loose, leafy green veggies. One final important thought about learning how to dehydrate. You’ll need to store all that dried fruit, etc. in jars and airtight plastic baggies. That is, if you want it to last for a long time. And if you’re riding out the apocalypse, you’ll enjoy dehydrated food for years. Maybe even decades.